This is the first in what will hopefully be a long line of Thursday Book Reviews. My focus will be on Young Adult Literature, with perhaps some Adult literature that has appeal to young adults in general. Please note that all opinions are mine and based on my feelings when I read the book – your experience may vary. 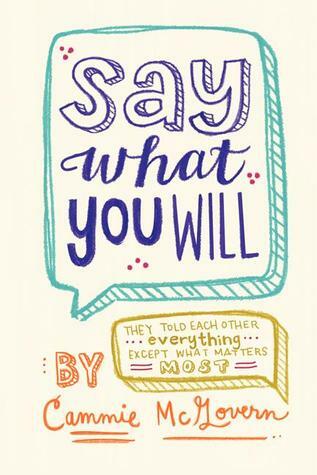 The book I have chosen to review is ‘Say What you Will’ by Cammie McGovern. This book was marketed to readers of John Green and Rainbow Rowell, two authors I enjoy. This book is the Young Adult Debut of McGovern, an author who has previously published books geared to an older audience. This book is about love, loss and learning to communicate. Amy was born with Cerebral Palsy. She cannot walk without a walker and relies on a voice box to verbally communicate with others. She has always been the smartest student in the class, however socially, she’s lagging behind her peers. Matthew has obsessive-compulsive disorder. His life has been ruled by fear, rituals and repeated thoughts that distract him from being able to live a full life. Amy and Matthew both live in the world but are unable to fully be a part of it. In a bid to make friends, Amy convinces her parents to hire student aides to accompany her to classes and help her in school. This role is usually filled by adults in her life, further isolating her from her peers. She convinces Matthew to apply and in doing so begins a journey that neither of them could have ever anticipated. This story is told partly in a series of messages between Amy and Matthew with narrative interjections in between messages to explain the characters thoughts and actions and partly in narrative form. We are told the story from both perspectives, learning more about what each feels about the developing relationship. We also learn more about their past, including how Amy has been treated in the school system and how Matthew began to develop his rituals. This all helps us understand how they develop their relationship and why they need each other more than they think. As their relationship takes an unexpected turn, we see how the love that they have that was so difficult to develop is so well deserved and hard won. The characters in this novel – not just Amy and Matthew but all of the characters, including the other student helpers, other classmates and the parents – are nicely developed. Even if you do not agree with their decisions and even if they do not seem like great character development displays, you understand why they made the decisions they did. The juxtaposition of the two main characters – Amy who would love to speak but cannot and Matthew who can speak but doesn’t – is a beautiful one, as the character that you assume would be weak is the strongest of the two. There are many lessons in here for everyone, in terms of examining how you live your life and what is important to you. At times the story seems unbelievable. There are plot twists that are questionable or feel as if they have simplified the situation (in making it complicated). This book is very situational and character driven and thus, with the plot issues you are reminded how people make bad decisions in their quest to be independent and mature; that no matter how mature these characters seemed, they are still teens learning their way through life. Readers who enjoyed ‘Eleanor and Park’ or ‘Looking for Alaska’ might enjoy this novel. I read this book on my Kobo App for iPad on June 8th, 2014. It was published by Harpur Teen on June 3rd, 2014. ISBN 9780062271129. 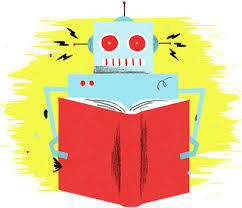 This entry was posted in Books, Reading, Reviews and tagged 'Say What you Will', books, Cammie McGovern, review, ROBOT. Bookmark the permalink.